3. Obvious gate scars will be left on the surface. 1. Suitable for production of large and deep barrel-shaped plastic parts. However, warping can easily occur due to contractibility and stress when applied on shallow and flat plastic parts. 2,For plastic parts that do not allow gate marks on the exterior, the gate can be designed on the inner surface of the parts. 2. Easier to remove the gate. 2. 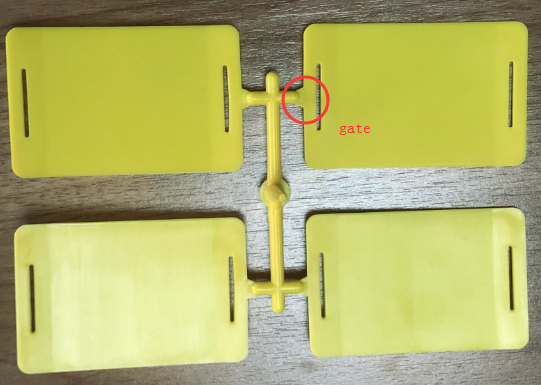 Gate marks are easily left on the plastic part. 1. Gate width W = (1.5~5.0)mm. Usually W = 2H, which may be appropriately increased for large and transparent plastic parts. 2. Height H = (0.5~1.5)mm. Specifically speaking, usually H = (0.4~0.6)d for commonly seen ABS and HIPS. 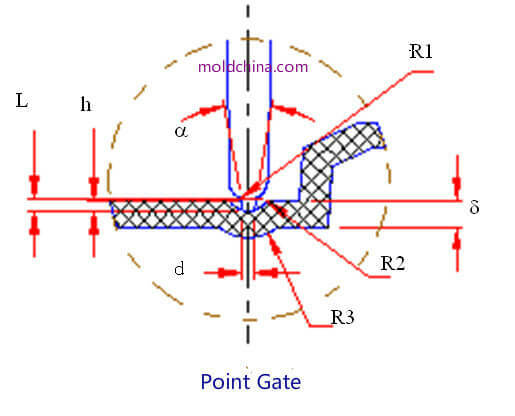 Among them, d refers to the basic wall thickness of the plastic part; H = (0.6~0.8)d for materials with poor fluidity, like PC and PMMA; the suggested gate height for POM and PA is H = (0.6~0.8)d, so as to help avoid shrink marks and wrinkles by guaranteeing sufficient pressure holding, because though these materials possess good fluidity, they become solid very fast with larger contractibility; for materials like PE and PP, gate height H = (0.4~ 0.5)d, because the small-sized gate is helpful for molten plastic shear thinning, thus reducing stickiness. 1. Suitable for production of plastic parts of various shapes, but it is will not be selected for slender barrel-shaped parts. 2. 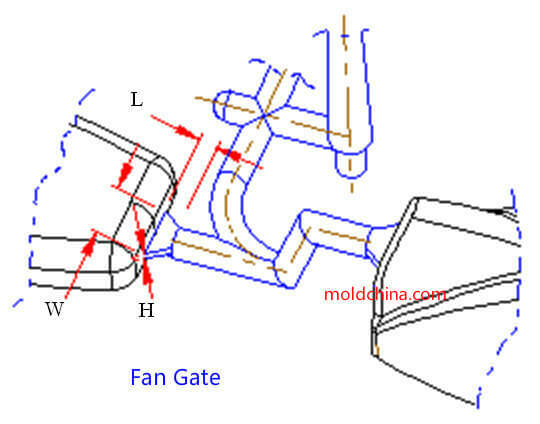 It is a typical impingement gate that can effectively prevent molten plastic jetting. 2. Obvious gate scars are easily left on the surface. Refer to the side gate parameters for application. Suitable for flat plastic parts that impose requirements on surface finish. 2. Lower the possibility of air getting into the cavity, to avoid the occurrence of defects, like silver lines and bubbles, etc. 2. Long gate marks are left on the edge of the plastic part, which need to be flattened by a tool. 2. 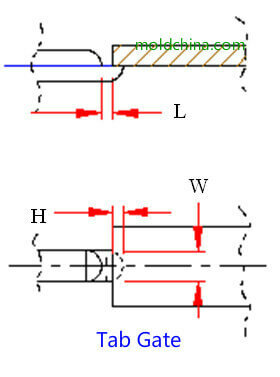 Width W = 8.00 mm to ¼ of the cavity width at the gate end. 3. The section area of the gate should be larger than that of the sub-runner. Usually used for production of wide but thin plastic parts, as well as transparent plastic parts and those with poor fluidity, like PC and PMMA, etc. 4. 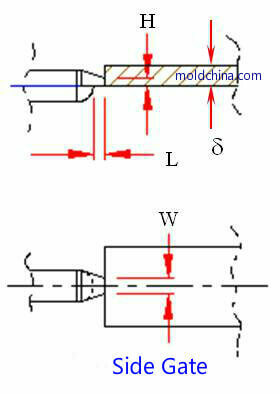 Applicable for both 2-plate and 3-plate molds. 4. Great pressure loss from the gate to the cavity. 4. Distance to the cavity A = (1.5~3.0)mm. Suitable for plastic parts that do not allow exposed gate marks on the exterior. 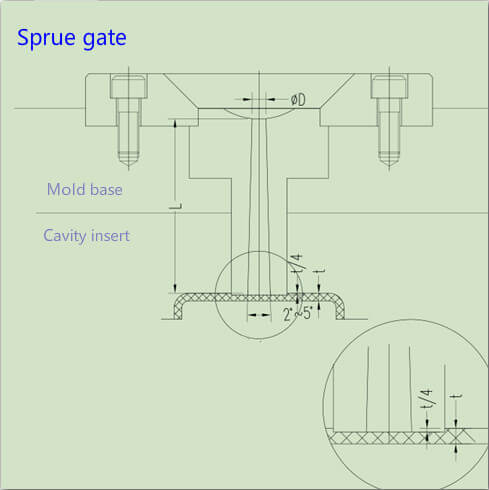 For a multi cavity mold, the resistances from the gate to each cavity should be kept as close as possible, so as to avoid viscous flow and obtain better flow balance. 3. No gate marks will be left on the exterior of the plastic parts. 3. Easily broken and thus blocking the gate if not appropriately designed. 3. Φ2.5min* refers to the gradual transition from the large end 0.8D to the small end Φ2.5. Normally used for ABS and HIPS, suitable for neither crystalline materials like POM and PBT, nor high-rigidity materials like PC and PMMA, so as to avoid the curvy runner from being broken and thus blocking the gate. 4. Low stress around the gate. 2. Complicated structure, usually employing the 3-plate structure. 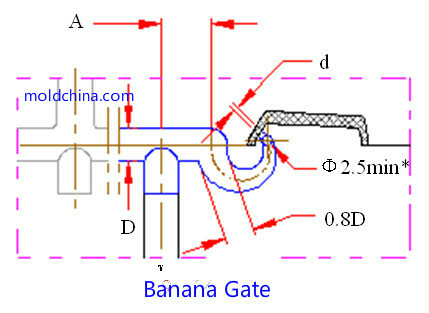 the gate and the runner are joined by arc R1 to ensure that the plastic part is not damaged when pulling the point gate broken; R2 = (1.5~2.0) mm; R3 = (2.5~3.0) mm; height h = (0.6~0.8) mm. Usually used for the production of large plates and bottom cases. 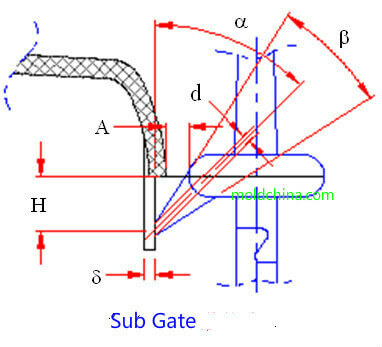 The proper distribution of gate can help reduce the flow distance of molten plastic and thus guarantee satisfactory distribution of melting marks; also able to be used for production of long barrel-shaped plastic parts to improve ventilation.